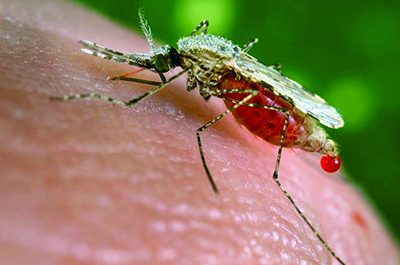 A species of mosquito known as Anopheles stephensi is especially good at evolving rapidly in urban environments to spread malaria. Certain species of mosquitoes are genetically better at transmitting malaria than some of their cousins, a team of Virginia Tech researchers has found. Of about 450 different species of mosquitoes in the Anopheles genus, only about 60 can transmit the Plasmodium malaria parasite that is harmful to people. The team chose 16 mosquito species currently found in Africa, Asia, Europe, and Latin America that evolved from the same ancestor approximately 100 million years ago. “With the availability of genome sequences from Anopheles mosquitoes of divergent lineages, variable adaptations, and differing disease-transmission abilities, we now have the exciting opportunity to significantly improve our understanding of these important malaria vectors and develop new strategies to combat malaria and other mosquito-borne diseases,” said Zhijian Tu, a professor of biochemistry, who published a paper on his findings in Science. The results support the idea that introgression — a process where genes from one species flow into another — plays a role in evolution, in this case by enhancing the capacity of mosquitoes to transmit the malaria parasite. In a further unraveling of the malaria transmission mystery, scientists analyzed the genome of a mosquito species notorious for transmitting malaria in urban environments. They discovered how the mosquito evolves rapidly to withstand a variety of environmental conditions, said Igor Sharakhov, an associate professor of entomology and co-senior author of another paper the team published.